Cannot be Normal Summoned/Set. Must be Special Summoned by a card effect. If another Insect monster is on the field, your opponent cannot target Insect monsters you control with card effects, also they cannot be destroyed by your opponent’s card effects. At the end of the Damage Step, if this card attacked: You can Tribute 1 monster; this card can attack an opponent’s monster again in a row. Once per turn, during the End Phase: You can Special Summon 1 “Insect Monster Token” (Insect/EARTH/Level 1/ATK 100/DEF 100). This card could be a great addition to decks that run a lot of Call of the Haunted or Back to the Front. Metamorphosed Insect Queen is a Level 7 Earth Insect-type monster with 2800 Atk and 2400 Def. These are decent stats on a Level 7 monster, and it is even better because the Special Summoning Conditions aren’t that problematic. She can’t be Normal Summoned or Set but she can be Special Summoned with any card effect. The reason to use a Trap card is to activate her effects during the opponent’s End Phase. She can create an Insect token which would give all Insects protection from targeting and destruction effects. Then, during your turn, she could tribute any one monster including the token to make a second attack on a monster if she already attacked a monster. Obviously Metamorphosed Insect Queen belongs within Insect Decks, but she could be splashed as an easy boss with built in protection and OTK potential. Definitely worth considering. We end this week off with the Insect Queen retrain, Metamorphosed Insect Queen. Metamorphosed Insect Queen is a Level 7 EARTH Insect with 2800 ATK and 2400 DEF. Level is fine, and stats are good on a Level 7. Insect has some ok support and EARTH is a solid attribute overall. This card cannot be Normal Summoned or Set and must be Special Summoned by any card effect. The only limitation to summoning this is what cards there are that can Special Summon this, other than that it should be easy to summon if you play said cards. If you have another Insect on your field, your opponent cannot target your Insects or destroy them with card effects. Nice for the Queen to protect all of her Insect servants. At the end of the damage step, if this card attacked, you can tribute a monster to let this card attack a monster once again in a row. Nice for OTK potential, especially if you tribute something that already attacked or the tokens this card generates. At the End Phase, you can Special Summon 1 Insect Monster Token (Insect/EARTH/Level 1/ATK 100/DEF 100). Nice for opening up Link Plays. I believe this is during either End Phase, but don’t quote me on that. 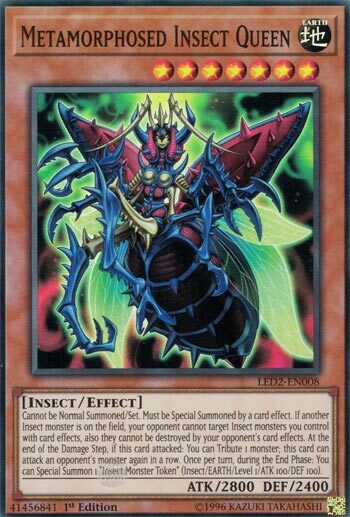 This new Insect Queen is some nice support for any Insect decks and Insect based strategies should consider this if they run cards that could summon this card. Art: 3.75/5 An improvement from the original Insect Queen. Metamorphosed Insect Queen is a huge, positive revamp on the original Insect Queen. The original, while a good idea, just wasn’t quite good enough. All right, honestly, straight up, it wasn’t that good, at all. I do find it odd, for a start, how the retrained Insect Queen here is still Level 7, unlike Barrel Dragon. Desperado got an extra star, which isn’t the biggest deal in the world, but Level 8 > Level 7…you can do more with Level 8 Monsters. The base attack is up to 2800, which is fantastic. She has an odd quirk that she can’t be Normal Summoned or Set, and has to be Special Summoned via a card effect. Now, for a huge benefit, this can be any card effect. There are ways to do this that are and aren’t Insect related, so there are a great many ways in order to bring her to the Field. She offers protection if she has an Insect companion (another wonderful upgrade) on the Field, from card effects and destruction by card effects. She generates Tokens like the original, but has one more new effect also. She can attack an opponent’s Monster again, in a row, as long as you Tribute a Monster first. The Tokens just increased in value for that effect. I’d love to see Insects take off, and this is a huge step in the right direction.